News, articles & the HelloMind community. "Hypnosis on an app actually works"
We are not surprised but very happy that the study shows such good results for people with atopic eczema. We are looking forward to seeing more studies about hypnosis and HelloMind. HelloMind wishes to push forward the development of digital services that are used to improve mental well-being. That is why we have sent our CEO Jacob Strachotta out into the world to tell everyone about our app. Here he is on stage in New Orleans talking about HelloMind at the 30th annual Psych Congress. The theme was “Disrupting Mental Illness”. FYI, Jacob is the guy with the white shirt and no jacket. After Kay was in a car accident she have been terrified of driving. And that is a huge problem because she lives in L.A., where driving is necessary. She tried HelloMind, and it helped a lot. 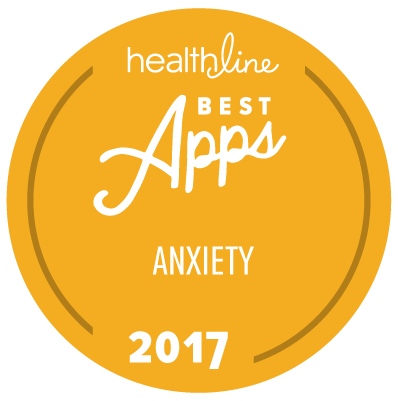 HelloMind has been named one of the Best Anxiety Apps of the Year again by HealthLine. “Anxiety can hinder your ability to enjoy a happy, fulfilling life. Luckily, learning to better manage anxiety is possible! Whether seeking professional treatment or individually coping with anxiety, we found some apps that can help in your healing journey.” – HelloMind is one of those apps. In June 2017, HelloMind received support for the HYPE-IT pilot project in collaboration with Aarhus University Hospital. The project is the first of its kind in Denmark and investigates whether HelloMind can reduce itching due to atopic eczema. "HelloMind is the only app that works"
Erica has tried a lot of different apps to fall asleep, but HelloMind is the only one that works every night. Peter is applying to become a soldier but has been afraid of heights for almost 10 years. HelloMind has helped him to get rid of his mental limit and he is no longer afraid of heights. Sam was an Iraqi ‘post war child’ with PTSD, depression, anxiety and very low self confidence. He was very skeptical about hypnotherapy, but tried HelloMind out of desperation. And it worked. He got rid of the depression and anxiety and he got the self confidence to follow his dream to become a realtor. “I was skeptical at first, but after a few times listening, I was hooked. Erik didn’t feel like the typical customer, but HelloMind changed his life and made it possible for him to go through his daily life and routine. Daniel used HelloMind to relax and have already felt a change in his sleep pattern. Now she is not afraid of success anymore. Not even a little bit. HelloMind has given Ryan a lot of confidence, and he is getting in a habit of doing a session every night. Paige was very stressed before she used the app. “I love it. It’s wonderful. There are many who wonder what hypnosis is and why it works. Therefore, we made a short video that explains it. Oliver didn't sleep well for eight years. Olivers sleeping problems had a negative effect on his social life, because he didn’t have the energy to see friends and family. He has tried al sorts of medicine, but nothing has been working. Watch the short video here. Gail is using HelloMind to relax after a long day at work. Also on the subway train. “My exam went much better than expected – I got a B! Simone got a stomach ache and felt that she had to throw up several days before her exam. Watch the short film that follows Simone before and after the exam. "It puts me in a place of complete serenity." Lauren uses this app to calm down, so she can get a good nights sleep.